It was only appropriate that an enthusiastic week of celebrating the 106th anniversary of Sacred Hearts Academy end where it all started—with the Sisters of the Sacred Hearts. 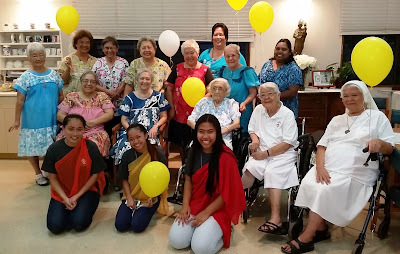 A group of administrators and students visited on Sunday evening with whom Sr. Helene Wood calls the “Golden Sisters” and also some who are still active in the school. Most of these ladies have many years of teaching at the Academy and take great delight in hearing about current happenings from today’s students. 1st row, seated: Sister Marie Dominic Reantaso, Sister Jane Frances Leandro, Sister Julie Louise Thevenin, Sister Anne Marie Tamanaha, Sister Angela Gregorio. 2nd row, standing: Sister Mary Josephine Araki, Sister Regina Jenkins, Sister Georgene Perry, Sister Helene Wood, Sister Katherine Francis Miller, Sister Irene Barboza, Sister Dolores Marie Pavao, Sister Vandana Narajan.